I’m thankful to have spent most of my life exploring and writing about New England, which continues to surprise and delight. I was born in Hawaii, grew up in Manhattan and, after 4 college years in Western Mass., couldn’t wait to get back to NYC. But at age 26 I lucked into a job as assistant travel editor at The Boston Globe and New England was my beat—with occasional detours to the Caribbean. Europe and Africa. In the city room I shared a typewriter with writer Bill Davis and we’ve been together more than 40 years. Because the Globe offered just 3 weeks maternity leave when our first son was born, I opted to resign but within a few months was back writing about New England as a free-lancer. This way of life continued through three sons, hundreds of articles and a number of books. The first book was How New England Happened (Little Brown & Co.) a historical guide to the region, quickly followed by Massachusetts, An Explorer’s Guide. That first Explorer’s Guide is now the stuff of family legend. I had been asked to write a guide to Massachusetts for a major German publisher — who died after I had completed the job but before it was published. Payment was generous enough to provide a downpayment for our much-needed home (a second son was on the way) and rights reverted to me because it wasn’t published. Through a series of flukes I connected with the newly-founded Countryman Press, now a division of W.W. Norton. The first Maine, An Explorer’s Guide quickly followed and I found that my journalist’s eye came in handy in guidebook writing, while the detailed on-the-road research demanded by books was a constant source of Globe stories. By then there were 3 young sons and I dragged them along, renting cottages from which to explore Mass. and then Maine, Vermont and finally New Hampshire . Our team offered especially well-researched coverage of ice cream stands, swimming holes and local emergency rooms. I miss those days. It can get lonely on the road. 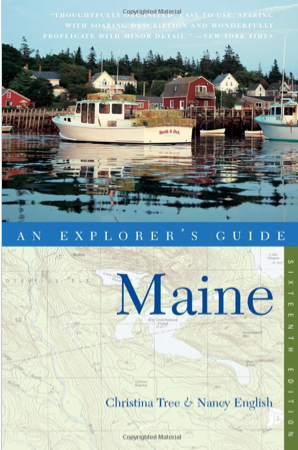 Eventually I launched another series with Best Places to Stay in New England (Houghton Mifflin) but the guide that has outsold all my other books is Maine, An Explorer’s Guide (Countryman Press) now known as “The Maine Bible” and in its 18th edition., with a new, sharper design and full color. For the past seven editions I have blessed to have a fabulous co-author, food writer Nancy English, We are presently working on the 19th edition for 2019. 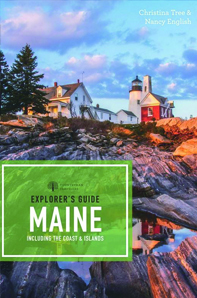 In 2017 Countryman (now an imprint of wwNorton) published the first edition of the Coastal Maine Explorer’s Guide, an expanded version of coverage of the coast and islands that the original Maine guide has included from the start. 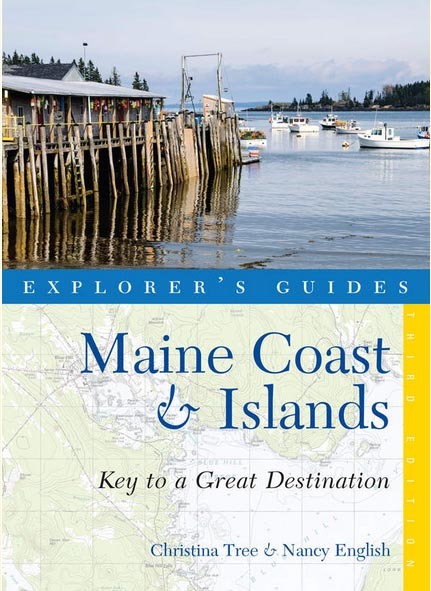 While it’s still around and is a good read, our slim Maine Coast & Islands, Key to a Great Destination, has been discontinued because it confuses readers who think that Explorer’s Guide format when it doesn’t. Why the publisher called it an Explorer’s Guide, we could never figure. Check the Explorers Guides page on this site for sample chapters and more about each of my current five titles. All four guides are available in electronic as well as hard copy editions Please see the Explorer’s Guide page for details about ordering. New in 2018 is the first edition of Vermont Backroads & Byways (wwNorton), co-authored with Vermont writers Lisa Halvorsen and Pat Goudey O’Brien, a handy guide for residents and visitors alike. I continue to write for Yankee Magazine, occasionally for the Boston Globe and other publications. We welcome all feedback and comments! This entry was posted in Uncategorized and tagged Maine, Maine guidebooks, Massachusetts, New Hampshire, Vermont on April 1, 2013 by Chris Tree.